A few days ago I had what I like to call a mini mental meltdown. I can't remember the last time I lost complete control of my emotional being like I did. I literally spaced out. A black hole began to form around me. I saw nothing but a white focal point in front of me and I just needed to....breathe. Scream. Cry. Smash something. I'm feeling incredibly distanced from my family and it's literally killing me inside. I've got some vacation time coming to me in July and I'm going home for a few days. That'll help, but it won't put a permanent fix on my feelings. YBJ made a brief stop here in Cleveland earlier today. He and David surprised me with a visit at my workplace, and I couldn't contain my joy. The sight of my brother brought tears to my eyes. We hugged, we laughed, we rolled down the highway in his beat-up truck to my second-short stint; the usual Friday night wine tasting. 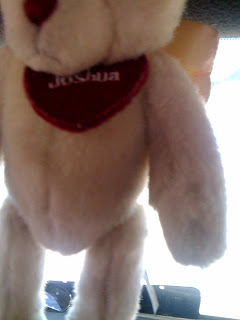 Hanging from the truck's rear-view mirror was the stuffed bear/angel I got him when he was hospitalized a few years ago. Silly, but the sight of that stupid stuffed animal made everything ok. Until my next meltdown. And unless my StepDad starts sending messages from the afterlife, it's so going to happen. Because on top of all the stress I'm dealing with lately, I really miss chatting with that man. This entry was posted by Frankie, on 5.30.2009. You can leave your response. I want to leave you a comment just to reach out to you. But there are no words to say. I have nothing to say (weird). I hope things get easier for you. I guess the only thing I can think of is to focus on the fond memories. Of your brothers, your man, Miso-cat, your mom, & your stepdad. Try to feel his presence. Meditate. Drink wine. Sing. Then, try to escape from your thoughts; a movie or something that you can submerge yourself in so that your mind is taken away from where it would normally go. I'm sorry this is long & rambling. I just want you to know that I've never met you, but consider you a friend. Sending you positive vibes.